Advocacy 101: See our new guide! Interested in getting into advocacy for your health condition community this year? Raising your voice to boost awareness about your condition or the reality of being a patient takes courage. 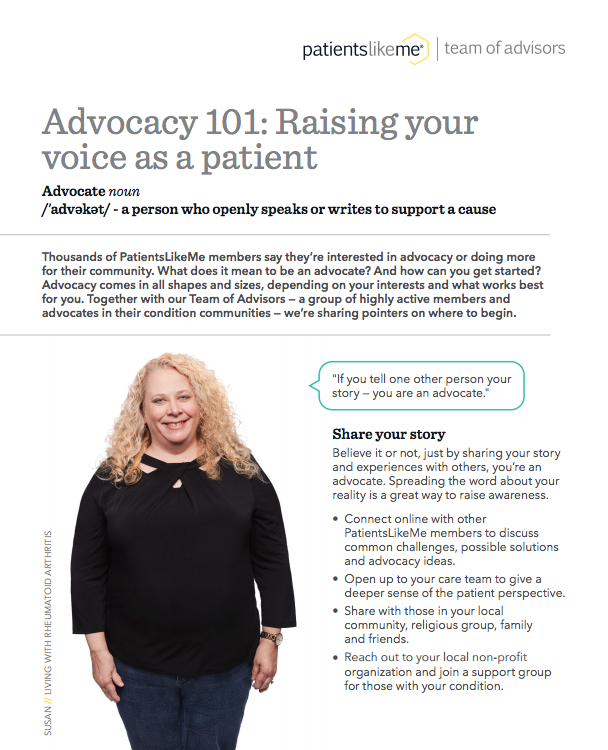 Yet it’s pretty simple to get started with advocacy, so together with members of our Team of Advisors (a team of highly active members and advocates in their condition communities), we’ve put together a new guide called “Advocacy 101.” See/expand and print the guide here! More than 30,000 PatientsLikeMe members indicate that advocacy is one of their interests on their profile. Join PatientsLikeMe or log in now to find and connect with these members here (filter the list to show others with your same condition using the “Condition” search field in the left-side menu). Have any advocacy pointers you’d like to add? Add a comment below or log in to share with the community here! The results suggest that patients with certain conditions, especially those living with fibromyalgia, PTSD and MDD, are less satisfied with their care. Believe their provider has fully explained treatment options. Just 47% of fibromyalgia and PTSD patients and 53% of MDD patients agree their provider has done so, compared to 63% of patients living with ALS, MS and Parkinson’s disease. Report that they are receiving the best possible health care for their condition. Only 40% of fibromyalgia patients, 49% of PTSD patients and 45% of MDD patients believe they are receiving the best possible care, vs. 66% of ALS patients, 61% of MS patients, and 57% of Parkinson’s disease patients. Change providers even though they think they are not receiving the best care or effective treatment. More than half of these patients (53% of PTSD and 56% of MDD and fibromyalgia patients) have stayed with a provider in this situation vs. just 31% of ALS patients and 36% of MS and Parkinson’s patients. See the full poll results at news.patientslikeme.com.